Analysis of Kazuo Ishiguro’s "A Family Supper"
Kazuo Ishiguro’s 1982 short story A Family Supper tells the story of a Japanese family, sitting down to dinner together for the first time in years. Having lived in California for several years, the son returns to Tokyo to his father’s house. While they wait for the arrival of the daughter, Kikuko, the son and the father talk a little about the mother’s death, the collapse of the father’s firm, and the son’s plans for the future. When Kikuko joins them, the father goes off to prepare the supper, leaving the brother and sister to take a stroll in the garden together where Kikuko talks about her life at university. They also recall their childhood fears of the ghost the son believes to have seen in the garden once. Before dinner, the father decides to show his son around the house. While they are eating, the son confuses a picture of his mother with the appearance of the garden ghost he remembers, which angers his father. The short story closes with the father inviting his son to come home again and confiding his hopes that his daughter may return home too. On the surface, this short story may appear shallow, perhaps even slightly confusing. 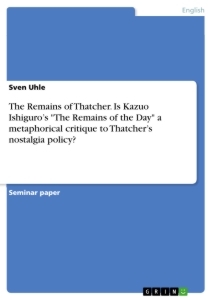 The reader, however, can rest assured that Ishiguro intended to draw attention to specific themes and has therefore charged seemingly random statements with meaning to convey these themes. Moreover, every reader is, to a certain, extent aware of the atmosphere the story creates and also receptive to a specific impression of the characters. 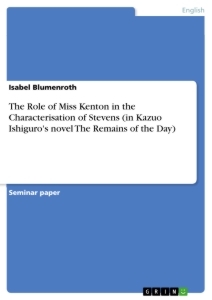 It is, therefore, advisable to reflect upon the different constituents of a short story more closely, in order to understand the story more clearly and to appreciate how Ishiguro succeeds in conveying these impressions. To begin with, in the attempt to create a specific atmosphere, the author of a short story can rely on the appearance of the setting to be an effective supplement to the narrative. The reader can therefore assume with some certainty that Ishiguro intended to communicate a particular ambience in portraying the setting as he did. The story plays in a Japanese family. The action takes place in the father’s house in Tokyo. When they arrive at the house, it is near dusk. The reader will notice that this background image of fading daylight serves as the basis for a story line in which shadows as well as dimly lit rooms add to an atmosphere of mystery. For it is not only the garden, which becomes ever darker, thus supporting the mystery around the ghost, only to fall into complete darkness at the end of the story (pp1. 436, 438, 442), but also the dining room where the family has supper, which is described as ‘a dimly lit room’ (p. 440). Furthermore, the son notices the father’s face moving from the ‘half light’ (p. 440) at the beginning of the meal into ‘shadow’ (p. 441) when they are about to eat the fish. As the reader does not discover what kind of fish it is, Ishiguro’s play with light intensifies the mystery of the scene. In addition, the house is described as very large, yet upon being shown around, the son remarks that most of the rooms, save one, are ‘startlingly empty’ (p. 439). Given that the reader has learned about the different losses the father has had to bear - the death of his wife, the collapse of his business, and the departing of his children - it comes to mind that Ishiguro may have intended to mirror the father’s state of mind in the house. This may be further encouraged by the fact that one room is crammed full of belongings (p. 439), showing that the father has not yet given up his hope to a happy life. In trying to understand how Ishiguro succeeds in communicating his narrative effectively, the thorough reader needs to give thought to the point of view from which the story is narrated, and to which effect this leads. A Family Supper is narrated from the point of view of the son, and can be classified, therefore, as a 1st person narration since the son is a participant in the action. As a result, the information the reader receives is not only limited to the knowledge the son has, but also to the particular focus of attention the son opts for. The description of his father can consequently not be regarded as objective (pp. 434, 435). Nor can we be sure that he and his sister were in fact close as children, as he says, or whether his personal impression is false (p. 436). The choice of narrator is crucial to the development of plot in this story. If it were told from the point of view of the father, the suspense surrounding the climax might be far less intense, as intrusion into the father’s thought would be possible. Hence, the question whether the father serves his family Fugu or not remains more or less unanswered, as the 1st person narrator cannot provide this information. What is more, the reader receives astonishingly few insights to the son’s thoughts, whereby his true feelings concerning his return to Japan would be interesting. As a short story is characterized by its brief span of narrative time, among other features, the author of a short story is faced with the difficulty of having to develop the plot in a very short time. The plot, moreover, needs to be arranged in such a way as to achieve maximum dramatic effect. 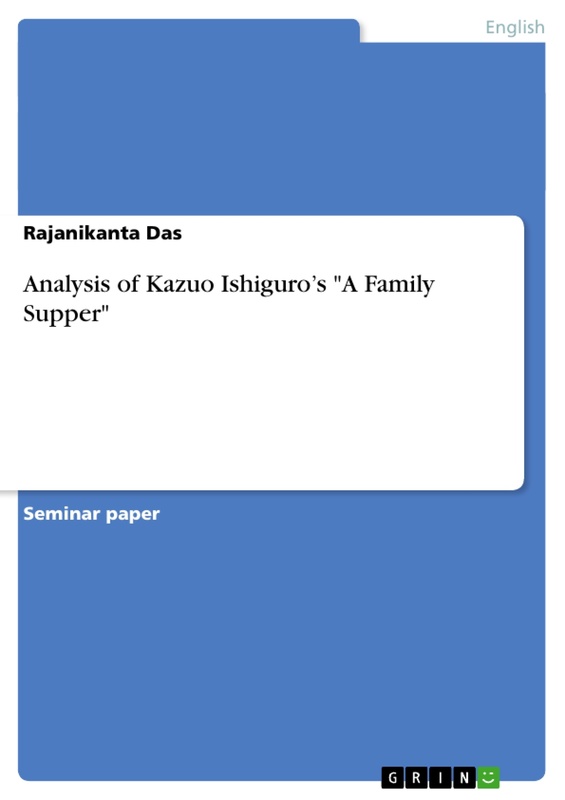 Ishiguro’s choice in arranging the plot of ‘A Family Supper’ not only ensures continuing suspense, but also an ongoing tone of mystery. The major contributing factor to this is to be found in the information the reader receives in the exposition. The report on the poisonous fish Fugu, as well as the account of the mother’s death (p. 434) directly introduce the reader to and confront him with the topic of death. 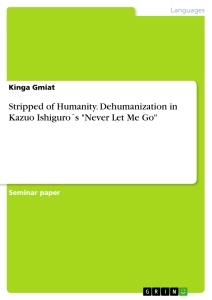 Ishiguro uses the subsequent scenes of rising action to communicate a specific picture of his characters to the reader. Foremost, the reader is guided to the impression that the father’s life has become somewhat joyless - the loss of his wife (p.434), the loss of his firm (p. 435), the big, empty house (p. 439). Moreover, the narrative repeatedly turns to topics concerning death or mystery, for example the father’s and Kikuko’s accounts of Watanabe’s death (pp. 435, 438 respectively). Ishiguro thereby alludes to the exposition again and again. The phase of rising action experiences one last jolt when the son believes to recognize his deceased mother in the ghost he saw as a little child (p. 440). The story reaches its climax when the father offers the fish dish as the final course. Undoubtedly, every reader is aware of the immense tension Ishiguro has managed to contrive in this scene. The reader’s mind rushes to recall the information from the exposition, the subtle hints at death and mystery given throughout the story, as well as the father’s lonely life. In addition, the extremely laconic statements concerning the fish uttered by the father and the son (p. 441), Ishiguro’s application of light and shadow to the scene, moving the father’s face from the ‘half-light’ (p. 440) into ‘shadow’ (p. 441), and the complete lack of insight into the narrator’s thoughts reinforce the tremendous suspense. Inevitably, the reader wonders whether the father is poisoning his family. However, it is doubtful whether the characters in the story experience this climax in the same way as the reader. For the reader regards the action from a more totalitarian point of view and the interpretation of the climax is therefore influenced by additional information such as given in the exposition or the setting. The characters, on the other hand, live, as it were, in the moment and are not manipulated in the way the reader is. Their behaviour does not give the impression they fear they are being poisoned. It can thus be argued that the story experiences a second climax: confused by his childhood memory of the ghost, the son does recognize his mother on picture(p. 440).